You have been controlled since birth. The New Deal of Franklin Roosevelt’s Progressive administration established many organizations that are being utilized to usher in the New World Order. (I will expose the United Nations later.) The Social Security Administration enabled the United States government to use its citizens as chattel for national debt even before they were old enough to work. Since the turn of the 20th century, the Progressives (created by Theosophists) began influencing the Federal and State governments. Illuminati have been advisors to many Presidents and the military, despite their lack of education and/or experience. There is much debate concerning Illuminati influence over the national Seal, money, etc., however, whether Illuminist and Hellfire Club Member, Benjamin Franklin, or the Illuminist/Progressives of FDR’s administration were responsible is really irrelevant at this point. Patriotism has been purposefully ingrained in United States citizens. Patriotism has been useful to gain civilian support for military and other governmental actions that benefit the Illuminati monetarily and add to their power while, at the same time, marching humanity into a trap. The education system is designed to disclose information about history and historical figures that instills in young minds nationalism, obedience to State authority, and a false understanding of world events. Overlaying the information you have learned about the Mysteries religion and its associates, Illuminati, Freemasonry, international bankers, and globalists, back into the historical record will give you greater understanding why wars and revolts began, and historic other world events make more sense. While the Puritans and Pilgrims were making covenants with the Biblical God and establishing communities in the ‘New World’, Satanic covens lived among them and began their work to cause division in the community. It is estimated that most people killed for witchcraft were innocent Christians who had been accused by ‘families’ later known to be members of covens. Later, Illuminati infiltrated the Freemasons, already ensconced in the colonies, and began molding the ‘American experiment’ to their benefit. At first, there was a great backlash against their Freemason-cloaked, Illuminist deception which was revealed mostly by the clergy. But, the backlash was countered with some of the Illuminati’s most commonly-used tactics of disinformation, personal/character attacks, and fifth column. The first two we see in politics today. When caught in a falsehood, attack the person revealing the lie rather than address the point being made; or, claim the facts given are simply not true then attack the person again. Fifth column tactics entails pretending to be part of another group while working to destroy that group from within. In 1647, the Massachusetts Bay Colony was the first settlement to require the establishment of schools based upon population: it was decided that towns of fifty families should have an elementary school and towns of 100 families should also have a Latin school. The goal of education was twofold: (1) to teach reading to facilitate Biblical study which instructs on moral character; and, (2) to provide skills for conducting business. Both goals support a healthy, growing society. And, American society grew rapidly. The Illuminati were overtaking Freemasonry in the United States during the late 1700s and early 1800s and its members were established in high places. They sought to control both education and government. At a time when the country was expanding westward and communities were small, a student's parents were financially responsible for schooling costs. Together with other parents, they maintained control over the curriculum. Through the efforts of men of wealth and means to establish schools for the ‘underprivileged’ in east coast cities, the educational system eventually shifted from private to public funding, allowing control to be held by school boards. Since boards were elected, anyone could sit on the school board whether or not they had children in school. Parents had less and less say in their children’s education. Control over education was eventually transferred to the Federal Government through the Bureau of Education established in 1867. By 1929, the Bureau of Education was renamed the Department of Education. Then the Reorganization Act of 1939 removed control of the education system completely from its citizens, even through their Congressional representatives, and gave it to the Executive Branch of the U.S. Government (read the Progressive-Illuminist influences of Franklin Roosevelt’s administration in the previous article), by placing the Department of Education under the supervision of the Federal Security Agency (FSA), one of the many cabinet-level agencies reporting directly to the President, bypassing Congress. The FSA was also a cover agency for the War Research Service from 1942 to 1944, tasked with development of chemical and biological weapons. Beginning with FDR’s Progressive administration, the balance of power designed in the Constitution was tipping evermore toward the Executive branch. The FSA also supervised other social activism departments created by the New Deal: the Social Security Board, U.S. Public Health Service, Food and Drug Administration (FDA), the Civilian Conservation Corps (CCC), and the National Youth Administration (NYA), to name a few. These agencies were granted great power over the public. The FDA has and continues to approve food tainted with poisons and genetically modified organisms, demanded the American Dental Association approve the use of fluoride prior to completion of safety testing, and approves medicines that are repeatedly withdrawn due to their harmful effects. The CCC became a model for The Corps Network, conservation and community service programs that engage primarily youth and young adults (ages 16–25), such as the ‘Obama Youth’. Videos of these teenagers are shockingly reminiscent of the Hitler Youth, elevating the leader to godlike status. Large numbers of youth were unable to attend higher education during the Great Depression. Educators feared colleges would suffer irreversible damage (their income would suffer) unless financial aid was available to prospective students. Eleanor Roosevelt worked with educators and relief officials, and lobbied Franklin on the matter. In June, 1935, FDR usurped Congress’ power again by signing an Executive Order establishing the National Youth Administration (NYA), another New Deal program. Congress refused to continue funding the NYA and it was abolished in 1945. Despite its abolishment, however, it continued its work under the radar. The Federal Security Agency was abolished in 1949 under President Dwight Eisenhower and most of its functions transferred to the newly created United States Department of Health, Education and Welfare (HEW). The Age of Enlightenment ushered in Theosophically-influenced, human-centered principles (Humanism) that were assimilated into the educational system. Unprovable sciences, and re-created historical accounts that eliminated the Biblical record (or changed history to make Bible history appear false), became part of the government-authorized curriculum. Names of Illuminists and their cohorts were removed from school history classes; and, events like the French Revolution and War of 1812 were completely rewritten to avoid any notion that some nefarious group was orchestrating events to their own benefit. No one would have volunteered for war knowing the Rockefellers, Rothschilds, or Morgans, had purposed it for their own monetary gain. Or, that the British intelligence group, MI-5, sponsored Italian dictator, Benito Mussolini’s entry into politics. The Hegelian Dialect explains how every war and conflict has been orchestrated by utilizing national identity and patriotism. Today, we use the term ‘false-flag’. The government plans an event or attack, alarming its citizens. The government then feeds its citizens only information that will elicit a desired response. Finally, the government offers a solution to the situation it has caused. The Illuminati orchestrated the events of the War of 1812, French Revolution, World Wars I and II, and every war and ‘conflict’ since. During the Civil War, Rothschilds’ London bankers backed the Union and French bankers backed the South; while the Lehman family made a fortune smuggling arms to the south and cotton to the north. The Illuminati always have members on both sides of a conflict and make vast sums of money while humanity perishes. All the while, the truth has been hidden – today it is accomplished through collusion with the media. Think about it. Do you know the truth about Saddam Hussein? The first Iraqi war? The wars today? Yet, our children are maimed and killed – for what? So Haliburton and their like can reap millions in profits? A new type of religion was elevated in education, the media, and government to replace God-based religions: Scientism. Scientism is a belief that science explains all and is the answer to everything (even when scientific theories cannot be supported). It is a philosophy elevated to truth - accepted without need of further merit. To accomplish this, Scientism needed an organization that would support its assertions. The (British) Royal Society was established in the 1660s as “a self-governing Fellowship of many of the world’s most distinguished scientists drawn from all areas of science, engineering, and medicine.” (royalsociety.org) The Royal Society was originally composed mostly of Freemasons. With a stamp of approval from The Royal Society, the principles and assertions of Scientism entered education. “Scientific societies are, as yet, in their infancy. It is to be expected that advances in physiology and psychology will give governments much more control over individual mentality than they now have even in totalitarian countries. Fitche laid it down that education should aim at destroying free will so that, after pupils have left school they shall be incapable, throughout the rest of their lives, of thinking or acting otherwise than as their schoolmasters would have wished.” Bertrand Russell, The Impact of Science on Society, 1953, pp. 49-50). Today, psychological views on relationships, self-identity, sexual identity, and other personal issues are being taught in public schools. But, psychology is a patently inexact ‘science’ since it cannot explain how the brain functions with minute differences for each individual. Nor can it fix the brain as a surgeon fixes an injury. Yet, it is a self-propagating and self-fulfilling group, establishing its own ever-growing guidelines for mental illness which it cannot cure. Further, Psychology’s roots go back to the Mysteries. Psychology became a ‘science' and a form of medicine during the Age of Enlightenment/New Age. In reality, the history of how psychology developed reveals its roots in Theosophy and the alchemy of the Mysteries religion (see also the previous excerpt on Theosophy). It is a conundrum that mysticism enjoyed resurgence during the Age of Enlightenment despite its opposition to the proclaimed desire for science and reason. Séance dinner parties were in vogue. And, it was at some of these séances that the ‘science’ of Psychology began taking shape. F. A. Mesmer (1734-1815), from whom the term ‘mesmerism’ derives, was an Austrian physician who arranged séances at which he attempted to cure attendees of various maladies. Mesmer’s work originated with the practices of alchemists from the Elusian Mysteries he had studied – the same Mysteries studied by Adam Weishaupt. Mesmer had been schooled from the age of nine at a monastery and then by Jesuits for four years in preparation for the priesthood, but he never became a priest. (You may recall that the Jesuits were founded under dark circumstances and were involved in Adam Weishaupt’s education, as well.) Mesmer’s techniques are now called suggestion and hypnotism and used in hypnosis and hypnotherapy. According to Blavatsky, Mesmer had been chosen by the ‘Great Brotherhood’ to bring the psychological portion of the Mysteries to the world, disguised as psychology. According to Theosophists, the Great Brotherhood, also called the Brotherhood of Light and the Great Masters, are none other than the fallen angels and Lucifer, the [fallen] angel of light. Theosophists admit these entities pose as Ascended Masters, Archangels and even the Elohim [Almighty God], yet Theosophists believe these spirit guides anyway. The spiral used in Mesmerism and commonly associated with hypnosis is one of the symbols of the Mysteries, found with other Mysteries symbols among the relics of ancient civilizations around the globe. The Labyrinth is a form of the spiral, having the same purpose in the Mysteries religion – spiritual development. Labyrinth designs are found in ancient Egyptian, Greek and Roman societies, as designs on pottery, baskets, wall etchings, and on Greek coins dated to around 400 B.C. Romans created decorative labyrinth floor designs using mosaics – many large enough for use in group ritual and private meditation. Different styles of Labyrinths have been found across Europe, Sweden, India, Russia, North Africa, and Egypt; and, are seen in Catholic retreat centers, cathedrals, and basilicas. 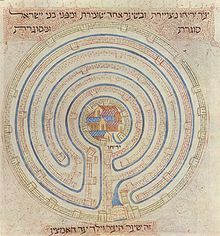 The most interesting information I found involving Labyrinths is artwork contained in a 1300s A.D. Hebrew Bible commonly referred to as the [Haim] Farhi Bible (picture above). The drawing is recognizable as a spiral-Labyrinth composed of seven walls with a city at its center. Below the drawing, the Hebrew text states it is the city of Jericho: the same pagan city that God directed the Israelites to walk around for seven days and on the final day, God would cause its walls to fall when the shofar was blown and the men shouted – and the city was thereby destroyed (see: biblearchaeology.org). When the surrounding Canaanites heard of this impenetrable city’s destruction, they were terrified of Israel’s God. But, Jericho’s walls are not described in the Hebrew Bible (Old Testament). How did the artist come to this rendering? Was an actual witness account passed down through the generations? Due to historical information, Psychology is principally based upon occult teaching from the Mysteries religion taught by the Egyptian Mystery schools and applied by Greek alchemists. It made its way through Roman culture, adopted by Satanic covens and the Illuminati; and, was eventually promoted by Theosophists who believe the teachings they claim came directly from Lucifer and other fallen angels whom they know are impersonators of the Biblical God and His Archangels.